The rails really came off Ferrari’s fading title challenge in Suzuka with team and driver making mistakes in both yesterday’s qualifying and today’s grand prix, but eventually Sebastien Vettel (top) salvaged fourth place and Kimi Raikkonen (bottom) fifth. 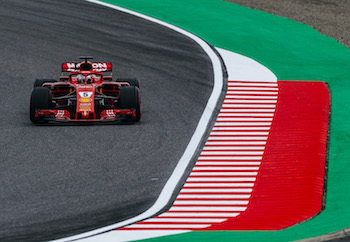 The rails really came off Ferrari’s fading title challenge in Suzuka with team and driver making mistakes in both yesterday’s qualifying and today’s grand prix, but eventually Sebastien Vettel salvaged fourth place and Kimi Raikkonen fifth. It was probably the most the team could achieve after the problems during qualifying and then both cars being damaged as a result of collisions in the race, which meant Vettel had to fight his way back up the field after spinning out and dropping to the back. 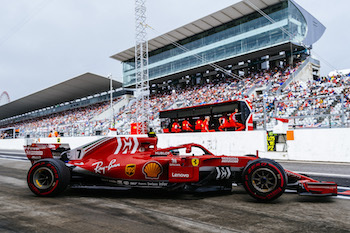 The race started with Raikkonen and Vettel on Supersoft tyres, fourth and eighth respectively on the grid after the team misjudged the wet weather conditions at the start of yesterday’s Q3 qualifying session. It was hot on the grid, with an air temperature of almost 30 degrees and track temp at 37 degrees. The Finn maintained his position at the green lights, while Vettel hugged the right-hand side and immediately made up two places. He then got past Grosjean with a miracle move around the outside of Spoon. At the end of the opening lap, Verstappen went straight on at the chicane and as he rejoined he nearly took out Raikkonen, who had to slow, which meant Vettel moved up to fourth. The incident was investigated by the Stewards, who gave Verstappen a 5 second penalty, while Ferrari Number 7 had some damage from then on. Lap 3 and the Safety Car came out as bits of Kevin Magnussen’s tyre were all over the track. The race was on again on lap 7 without any changes to the order. On the next lap, Vettel gave it a go, optimistically attacking Verstappen on the inside of Spoon, but they touched and the Ferrari spun. Vettel rejoined in 18th place and began fighting his way up the order, passing Marcus Ericsson. The move was investigated but no action was taken. On lap 18, Raikkonen pitted taking on Mediums, before passing Ocon to go eighth. Seb meanwhile worked his way up to twelfth. Verstappen pitted and took his penalty. Raikkonen closed on him but lost time behind Gasly and could not pass. His lap times were affected by the earlier damage and he found himself fifth behind Daniel Ricciardo after the pit stop. Vettel made his stop after 27 laps and fitted the yellow-banded Softs. It was showtime and he was straight back in the points, as high as seventh when he set a fastest race lap on lap 33. He then gained another place before his pace matched Raikkonen’s who was too far ahead to be caught. But in the end, Vettel at least had the satisfaction of the fastest lap of the afternoon in 1:32.318.